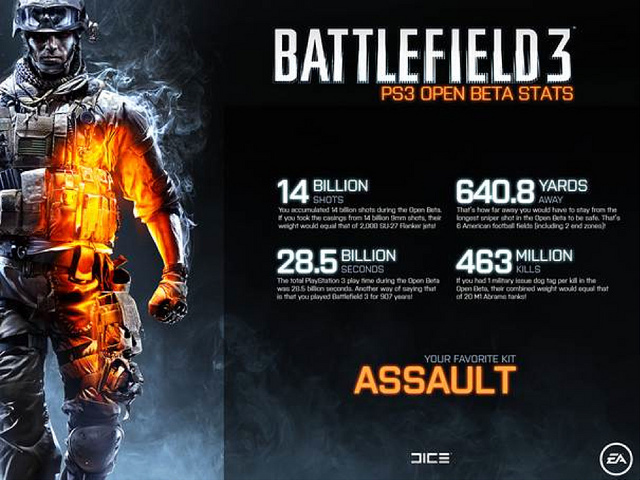 DICE have revealed some information from the recent Battlefield 3 Open Beta, as well as improvements made to the game as a result of the beta. But it’s not all network load balancing and matchmaking algorithms; check out the info graphic below for some quick facts on the Open Beta. The netcode is one of the many things that we tested as part of the Open Beta and it was not necessarily reflective of the final retail game. The DICE team appreciates, and has heard, the feedback you’ve provided and is further optimizing online play.